The most awaited teaser of Vivegam aka Thala57 is out. After a shocking leak, all the Thala fans stormed into their phones to catch the leaked 57-second teaser cut by Ruben. Ajith Kumar joins hands with director Siva for the third time in this out and out action- filled-massy entertainer. 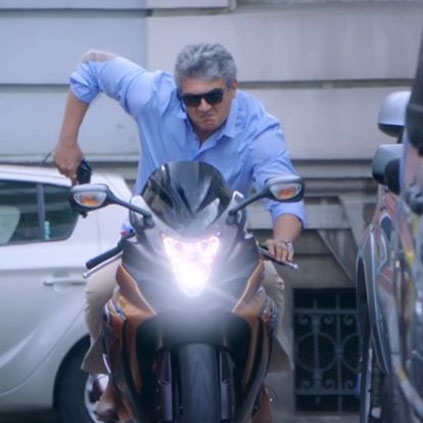 The pulp of the teaser exists in the shots which show the lead hero, Ajith. They show off some superb visuals from Bulgaria while they introduce Ajith as an Interpol agent working in the Counter Terrorist Squad fighting against the likes of a most wanted international terrorist, played by Vivek Oberoi. The teaser ultimately favors Ajith, and it has stunning shots of the charismatic hero as he gives a very powerful voice over in his usual robust tone. It looks like Ruben has cut out an Ajith special for the fans of the star. The team has decided to subtly put out the core of the film while showing the extreme heroism of Ajith by placing shots of him performing pull-ups on a tree and also smash it with his bare fists. Anirudh's music gives us a slight twitch below the eye as it doesn't catch the right chord at its first listen. A single of the rap track which features in the teaser may help us develop a better opinion on the backing track of the teaser. Though the film seems to be completely set in a foreign country, Siva breaks the shackles and follows cliche by penning authentic Tamil dialogues along with an English inspirational punch- ''Never Ever give up''. Even the tagline for the title reads- ''Believe in Yourself'' and Siva has tried to showcase the massive physical transformation in tandem with an expected motivational storyline. Overall, a sure-shot hit amongst the actor's die-hard fans, but may fall short by a notch amidst the neutral viewers. Exclusive: Vivegam editor reveals an interesting secret about the teaser! Vivegam teaser: Is this an interesting coincidence or a planned move? Just In: Vivegam director reveals more details about the teaser! People looking for online information on Ajith, Anirudh Ravichander, Siva, Vivegam will find this news story useful.